Welcome to our second of five articles looking at 5 trends in eLearning. What may not be so clear is that preparing workers to be ready and able to perform their jobs requires more than just training programs. The solution must build skills and knowledge to match specific on-the-job needs. And the critical nature and fast pace of operations in the oil and gas workplace requires immediate access to knowledge and information. 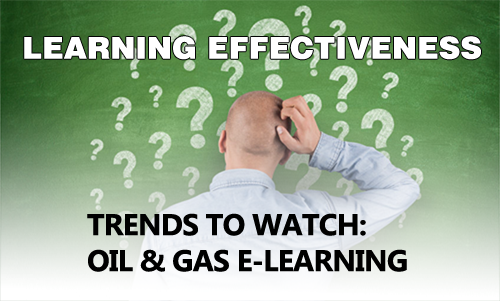 On-demand access to e-learning programs helps oil and gas companies cost-effectively meet their training and development initiatives. Knowledge gaps drive the need for on-the-job e-learning. E-learning modules provide interactive learning in a format designed for individual access on demand through the internet. 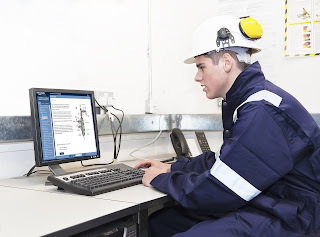 Access to eLearning from workstations and other devices facilitates on-the-job training. On-demand means access to e-learning programs anytime, anywhere with an internet connection. On-the-job access means training employees while they are working, as opposed to sending them to an offsite location. Flexibility leads to cost savings and improved productivity and performance. 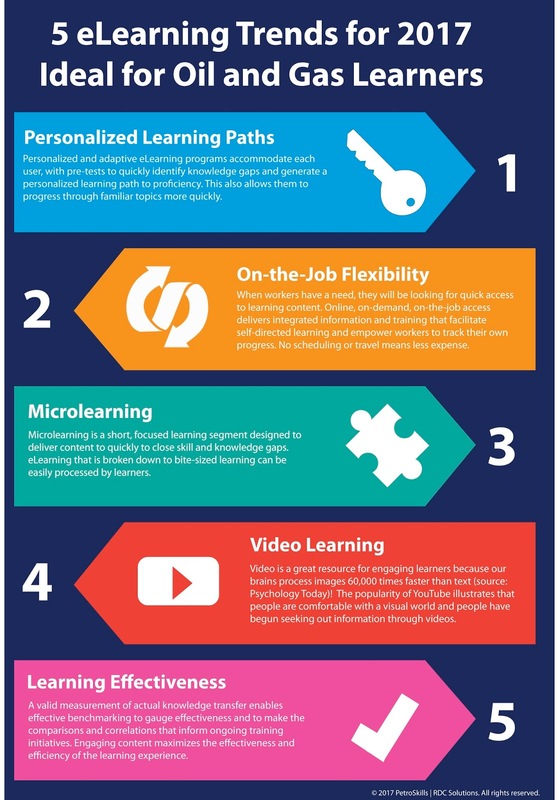 Job training can be delivered in a number of ways, for companies incorporating new training programs, a major advantage of e-learning is flexibility. Learners have the ability to participate in online courses from anywhere with an internet connection. This eliminates coordinating where and when a course will take place and gathering a group of employees together in one place. This flexibility means management and employees are able to complete important “just-in-time” training as requirements change. Additionally, because of the flexibility of being able to use it from any location at any time, e-Learning allows users to control the learning environment and access training at the most convenient times eliminating as many distractions as possible. They don't have to follow a specific schedule. The flexibility of e-learning benefits the bottom line in several ways. Traditional classroom courses have costs associated with the instructor managing the class, travel expenses, and time away from work. Since training is completed online, there isn't any need to make travel arrangements or to spend money on transportation costs, meals or lodging. Training employees while they are working, as opposed to sending them to an offsite location, increases the chance that learned information will be fully assimilated. E-learning helps companies create a higher quality, more effective training experience for employees, at a more affordable cost. On the job training is cost effective for companies because it often requires fewer resources than having to recruit new employees. 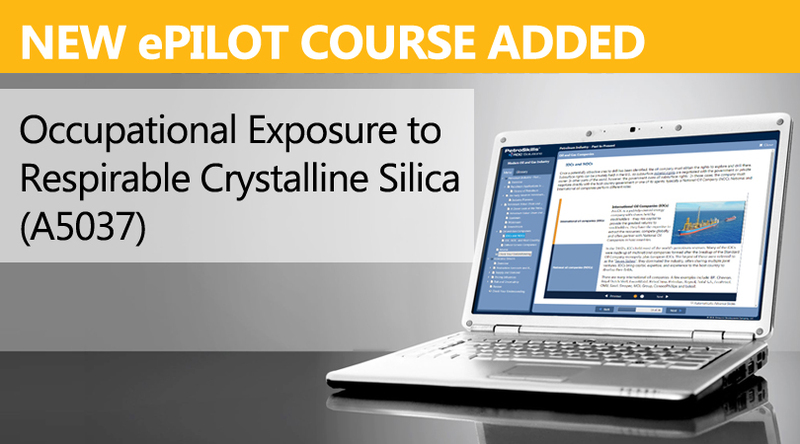 Updating and reproducing learning materials is costly and time-consuming. E-learning let you update programs quickly and easily, and since they remain online, you can save on printing costs. ROI is one of the clearest benefits of e-learning for businesses. It is effective. Online training allows employees to quickly get up to speed. Neuroscience tells us that the key to building connections and context for new knowledge is connecting it to the learner’s prior knowledge and experience. Linking courses with work activities can improve retention and reduce the time for someone to become an independent contributor. Learning that is embedded in work can be put to use immediately. E-learning provides consistent training, eliminating problems with different instructors teaching slightly different material. It can be updated quickly by uploading content to the server and it will be available then to all learners. Training can be tailored to suit the needs of the company with site-specific parameters so that new trainees can be integrated into the company without learning skills externally that may not fit their specific role or company. Even though the course material is consistent for all users, e-learning allows each individual learner to control the pace of the course, which can’t be done in a classroom setting. The flexibility of e-learning allows learners to revisit key information right when they need it. And employees can access important resources any time they encounter a question or difficult situation. It is easy to see why accessible e-learning plays a significant role in the acquisition of skills and knowledge in the workplace. It pays for itself in performance and productivity gains, in reduction of risk, and in the benefits of compliance. 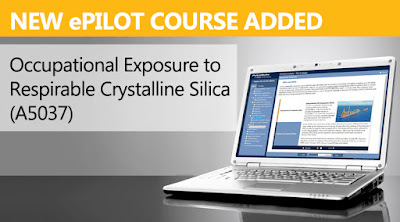 Making such meaningful impact requires effective eLearning developed specifically for the oil and gas industry’s needs. Contact PetroSkills RDC Solutions to discuss putting eLearning to work for your company. Email solutions@petroskills.com. 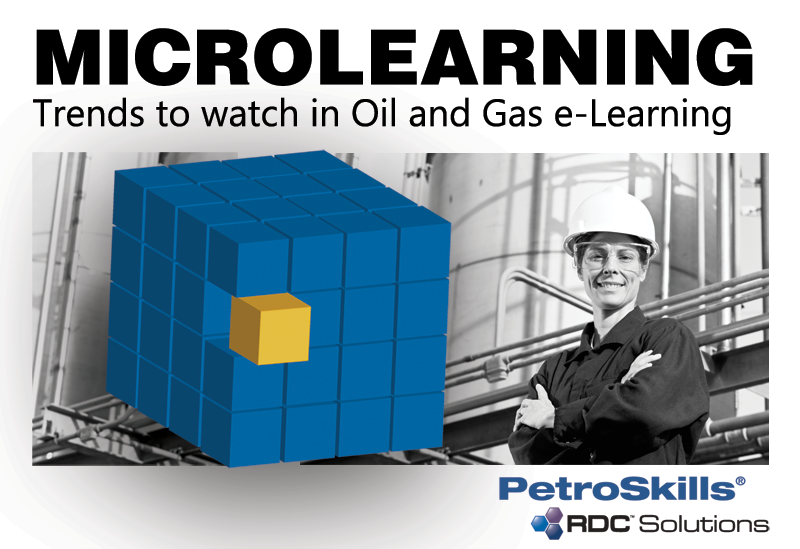 Or visit www.petroskills.com/rdc. In the oil and gas industry, the need to stay up-to-date with skills and safety training and regulations is critical. Any gaps between what workers know and what they should or are required to know increases risks to safety, productivity, quality, and compliance. A single gap can seriously jeopardise every safety and quality improvement effort and a company’s good standing with regulatory compliance agencies. 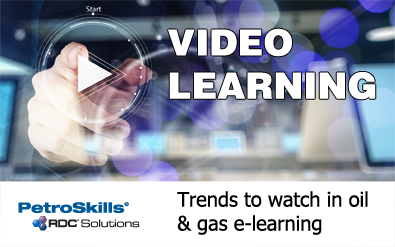 Along with global organisations in all sectors, the oil and gas industry is facing challenges to training and development from dwindling budgets, limited resources, and a changing workforce. Forward looking companies know that they must leverage technology in smarter ways to help lower costs, mitigate risks and strengthen their development ambitions. Intelligently incorporating the eLearning functionality of learning pathways, means doing just that. Rather than just offering a “one size fits all” approach, learning pathways offer new ways to structure learning content to accommodate each learner’s unique needs. Personalising the learning pathways leads to accelerating the time it takes to develop proficiency. 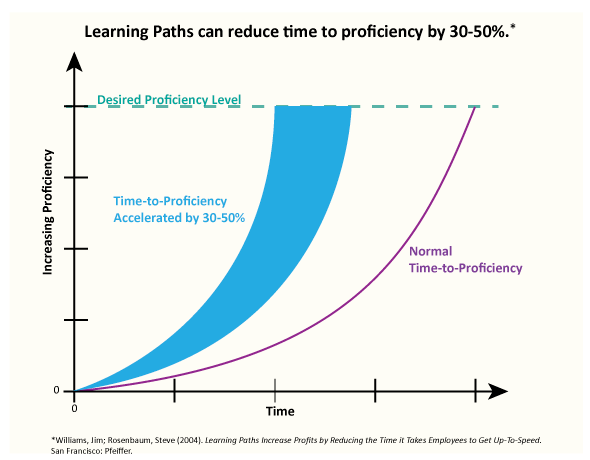 In fact, Learning Paths have been proven to reduce time to proficiency by 30-50%. [Williams, Jim; Rosenbaum, Steve (2004). Learning Paths Increase Profits by Reducing the Time it Takes Employees to Get Up-To-Speed. San Francisco: Pfeiffer.] 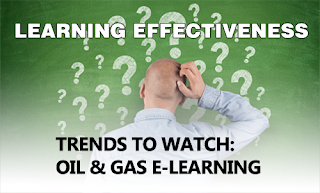 By integrating personal learning pathways into training and development, oil and gas organisations could see reduced time-to-proficiency, reduced costs, and achievement of their compliance and organisational goals. Only train the learner on what they need to know. Do not train them on what they already know Learning pathways do this by tailoring the content to the learner. First, the knowledge requirements for each job role must be defined in a curriculum. Each job role has specific knowledge that is required to fulfil the job role with proficiency. 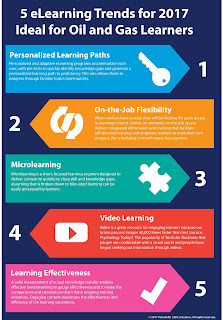 In eLearning, these specifics can be segmented and mapped into learning modules. By defining what learning modules would fulfil the knowledge requirements we now have the entire content and can create a pathway starting from the most basic knowledge to full proficiency. Additional requirements can be managed and tracked in the pathway such as site-specific parameters, pre-requisites, re-training time frames and alternate courses. Next, the learner’s proficiencies and gaps must be determined. A mastery assessment/pre-test compares each individual’s knowledge to the job-specific knowledge requirements identifying gaps and proficiencies. Once the individual’s unique knowledge gaps are identified, a personal learning path is dynamically and automatically generated to close those gaps. Proficiencies allow the individual to move ahead without taking training they don’t need. A personal learning pathway is created for each learner to progress to complete proficiency in all required job-specific knowledge. The technology makes this a dynamic environment that responds to changes in abilities and provides immediate feedback to learners. The choice regarding which learning modules need review and which have been mastered is not left up to the discretion of a supervisor, or even the learner themselves. All knowledge needed for the job, as well as the unit and site (including best practices and compliance mandates), is conveyed to every learner in that job role at a pace that suits each learner. Rather than following a ‘A to B to C path,’ any areas where the learner is already proficient are excluded and the topics where he/she is not will be remediated. For example, suppose a job requires the ability to perform math calculations. It would be a waste of both the learner’s and the company’s time to be trained on basic math skills when he/she can already add, subtract, divide and multiply at a high school level. Instead, having demonstrated math proficiency in a mastery assessment, the personal learning pathway moves that learner on to higher level math operations. The personal learning pathway is more than a just a series of steps that lead to the learner being able to reproduce knowledge or action. It allows individualised pathway that only delivers training needed, not skills already mastered. It’s a focused approach that uses time and resources far more efficiently. 2017 e-Learning Catalog available now! See what's new. The new e-Learning catalog is available. Download yours now!